Normally, the material of aluminum honeycomb panel face sheet is selected from 3000 and 5000 series, instead of 1000 series. The surface treatment is spray coating or roller painting, the coating is polyester or fluorocarbon paint. For exterior wall panel, it would be better to choose 3 layer spray coating, the paint layer is ≥40μm. This ensures the durability of the coating, then the color of honeycomb panel surface can keep long. 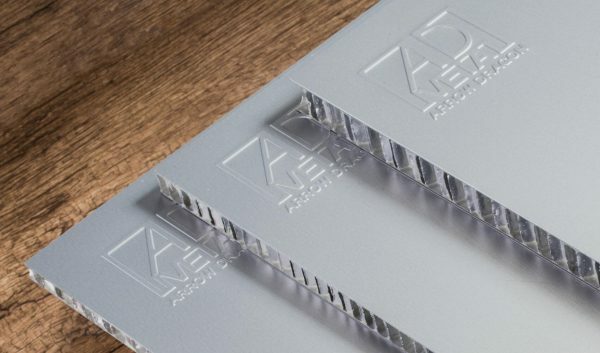 The aluminum plate is subjected to a strict surface anodization before painting to ensure sufficient coating adhesion and bonding strength with the honeycomb core. The aluminum plate should be treated strictly by anodization on surface before painting. By this treatment, it ensures sufficient coating adhesion on aluminum plate and bonding strength with the honeycomb core. The face sheet and base sheet should be the same material, and the surface should be anodized. The expose side should be coated with protective coating, such as polyester, epoxy or acrylic. The coating can prevent the aluminum sheet from air corrosion during the long-term exposure. The aluminum honeycomb core material is manufactured by aluminum foil and special honeycomb node glue on the aluminum honeycomb core production line. The factors affecting the performance of the honeycomb core material mainly include parameters such as aluminum foil, node glue, and honeycomb core specifications. The aluminum foil should be 3000 series with strict surface treatment. When the products with high strength or durability requirements, it should be very cautious to adopt 1100 pure aluminum as the honeycomb core material. We use Bio-component polymer epoxy adhesive film and Bi-component modified epoxy resin. It not only provides sufficient bonding strength but also has excellent environmental resistance and high and low-temperature resistance. Common adhesives tend to degum the honeycomb core due to low strength, resulting in overall failure and instability. The node strength of the honeycomb core is the main basis for evaluating its performance, and its node strength data should be ≥2.0N/mm.